The most remarkable thing about Rick Perlstein’s Nixonland is that it was published four and a half years ago, before Barack Obama was elected president, before the Tea Party, before Occupy. Otherwise you might be forgiven for thinking that Perlstein was drawing meaningful parallels between our era and the 1960s and early 1970s of Richard Nixon’s heyday. There’s no way he could have been, of course. But it sure feels that way. It is easy to forget that our current toxic “red state/blue state” opposition is nothing especially new, even if it has taken on a novel geographical aspect—a “big sort,” as Bill Bishop has it. We neglect to trace our current divide back through the Reagan era, through the Nixon era, to 1965, which is Perlstein’s starting point. The United States has been two oppositional yet intermingled nations for nearly fifty years, and Perlstein sets out to find out where it started and who stood to profit from exploiting that tension. How did he do it? The answer is obvious to us, because it’s the political air we now breathe: cultural wedge issues. It wasn’t so obvious at the time. Nixon pioneered the alchemical transmutation of fear of change and class resentment (where class is a cultural category, rather than strictly an economic one) into virtues, a subtle manipulation that Perlstein calls “political jujitsu.” How dare those artists and movie stars, those pinko professors and Establishment liberals, that liberal-biased media sympathize with the Communists we’re fighting in Korea and Cuba and Vietnam, the druggie degenerates who are tearing apart the moral fabric of our great nation and perverting our children, the civil rights activists and Yippie political agitators who want to change our venerable Constitution and overthrow our government? How dare they throw their “tolerance” and “experimentation” in our faces? We just want economic stability and peace and quiet in the streets and the kind of life our parents had, only more prosperous. And so, after a quick summary of Nixon’s boyhood, education, and early political career—including the all-important “Checkers” broadcast, in which Nixon gave an early virtuoso performance of his uniquely passive-aggressive brand of moral suasion—Perlstein throws us into the Watts riots of 1965, where the era of Great Society peace and prosperity promised by Lyndon Johnson’s 1964 landslide victory (the 1960s equivalent of Francis Fukuyama’s 1992 premature prediction of the “End of History”) immolated itself before a shocked television audience. Nixon took in the violent cultural fault lines created by desegregation and protest against an already unpopular war. He understood that once equal rights became a statutory reality, oppressed blacks would not tolerate anything but the full and immediate fulfillment of that legal promise, which most whites, especially Southern and working-class whites, would not abide. He saw that the traditionally Democratic South was appalled by LBJ’s liberal turn on civil rights and desegregation, and that in the North, traditional Democratic stalwarts such as labor unions and big-city machines felt as though their interests were being ignored in favor of rights and privileges for blacks and the non-working poor. And in all this he saw opportunity—opportunity for a traditional-values based Republican party, led by Richard M. Nixon, to make inroads into perennial Democratic strongholds. 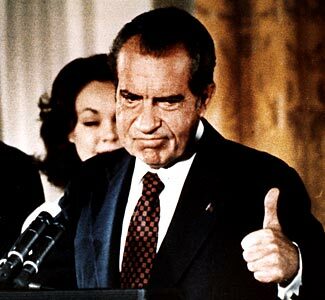 Nixon was always a hard worker, and he put all his energy, stamina, cunning, and political influence to work. Perlstein goes into great detail as he traces the disintegration of the Democratic party—first at the notorious 1968 nominating convention in Chicago and then at the less-infamous, but perhaps even more damaging, 1972 convention in Miami Beach—and the implosion of George McGovern’s presidential run. Perlstein rightly sees McGovern’s campaign as doomed from the start: though his ill-advised choice of Thomas Eagleton as his running mate was the coup de grace, it was the Committee to Re-Elect the President’s sabotage, the internecine skirmishes and philosophical contradictions between rival candidates and factions, and the neutering of the once-powerful bosses, capped off by a three-ring circus of a convention that showcased the party’s divisions and apparent frivolities, that preordained the Democrats’ failure. Simultaneously, he follows the rise, and the beginning of the political demise, of Richard M. Nixon. Perlstein’s talent (at least here) is not with original research (Nixonland contains little, if any), but with sifting through secondary sources and collocating and analyzing his finds. He arranges his facts to speak for themselves, and his style of analysis is subtle and unobtrusive, interwoven into the narrative so well that the reader sometimes fails to notice that the story has taken a didactic turn. He is also an astute student of politics and a political realist, with a deep respect for the compromise, the coalition, the power play, and even machine politics to a degree (for an excellent short-form example of Perlstein at work, see this recent piece on Barack Obama’s roots in Chicago machine politics). It is here that the lessons he takes from the history of Nixon’s era differ from the usual partisan fare—even when he’s using source material written by partisan observers—and where his analysis of the politics of that time provides unsettling insights into our current situation. He stresses how radicals’ chronic aversion to compromise and coalition-building, and their incorrigible overestimation of the majority’s tolerance for rapid change and novelty, nearly always dooms their efforts to effect reform, and how the top-down reforms they are able to institute so often meet with resistance from the rank-and-file. The radicals’ fetish for open discussion and equal and democratic representation in all decisions, especially in combination with the aversion to compromise and coalition, creates deadlock and endless delay and forecloses any possibility of quick executive decision-making and nimble response—a lesson that the Occupy movement has yet to take to heart. And all too often, there is a Richard Nixon figure, an adept of Realpolitik, to capitalize on the chaos that ensues. And about Realpolitik: an argument that Perlstein seems implicitly to make is that Nixon’s downfall was at least partly a function of his transformation from a sort of Manichaean figure, the scourge of State Department crypto-Communists and hippies and champion of the “Silent Majority,” to a disciple of Henry Kissinger’s amoral power-worship. His manipulations vis-à-vis the Vietnam war—of facts, of the lives of POWs—and his brute, naked lust to gain a second term as president, his increasing paranoia, his stonewalling of the press, his abandonment of principle in the economic realm as stagflation and competition from Japan and the Common Market created trade imbalances and degraded the value of the dollar, his need to surround himself with venal yes-men who would do literally anything to get a leg up on the president’s “enemies”: these were distortions and exaggerations of Nixon’s character flaws that only grew the more power he amassed. It is an interesting theory, if it can even be called a full-fledged theory, but it smacks of the kind of armchair psychoanalysis that Perlstein claims to disdain. Nixonland is a big book, a sprawling history, given its seemingly narrow focus of a seven-year period, and its epic scope and accumulative nature have the virtue of presenting the reader with a wealth of trivial information and glimpses—foreshadowings—of things and people that will become important only later. We meet a young Karl Rove, a campus Young Republican who ingratiated himself into the Committee to Re-Elect the President by bringing to the ’72 campaign a bag of political tricks garnered in college elections. We meet a newly-divorced Senator Bob Dole on the prowl, sporting bell-bottoms and a fake tan. We see early abuses of the Political Action Committee in John Connally’s Democrats for Nixon, which produced one of those tasty if vapid statistical coincidences that really make reading history fun: the specious claim, in a TV ad, that George McGovern would make 47% of the population eligible for welfare. But the agglomerative method also has its drawbacks: one finds repetitions of unfortunate words and phrases—near-comical overuses of the phrases “slow, soiling humiliations” and “man bites dog,” and of the words “solons” for legislators and “exuberants” for conservative die-hards come immediately to mind—as well as the sort of minor factual errors that have the effect of calling into question the veracity of more important claims: the film Straw Dogs is not a western; Richard Nixon’s father was born in Ohio, not Indiana; and the chief official of a Nazi political district was a Gauleiter, a German word, not gauletier, a real-sounding but imaginary French one. On a more macro level, while one shudders at the possibility of seeing scores more instances of “slow, soiling humiliations,” it might have been interesting had Perlstein lent his skills to taking the book all the way through Watergate to Nixon’s actual resignation, rather than leaving off shortly after the 1972 election. But that could well be an entire 900-page book in itself, and Perlstein succeeds admirably in proving his point in the period he allotted himself. What remains to be seen is whether American politics continue to exhibit—as in Nixon, in his pupil Ronald Reagan, and in Reagan’s student George W. Bush—the pattern of ruthless power-seeking by the Right, and rudderless floundering and fissile factionalism within the Left. The human cost of such recurrent dysfunction is higher than ever.